The quality control checklist should be used while the shipment inspection is done by auditor and quality inspector. In the apparel manufacturing, checking of raw materials, semi-stitched garments, stitched garments, and finished garments is done by internal quality assurance team. The manufacturer aims to pack the quality garments for shipping. But as a buyer, one should not completely trust the manufacturer’s inspection report. Therefore, buyer’s QA representative needs to do the shipment inspection after complete shipment is packed by the supplier factory. As a buyer or quality assurance personnel or shipment auditor, you need to follow a quality control checklist for ensuring everything is covered during the inspection process. Assessment of the product quality should be done unbiased. A quality checklist is very helpful in this regard. In the post, I will show you the quality control checklist those need to be followed for product sourcing. While doing a quality inspection of the shipment, various parameters are considered to ensure the product quality, packaging quality, and product safety. Through stitching, process fabric is converted into garments. Therefore, the stitching quality must be as per the standards. All trims and accessories (like drawstrings, beads) are attached to the garment as per safety norms. Also read: How to make garment inspection report? Check if the garment is balanced (left and right side of the garment) and falls properly when holding with two hands. Text and print layout in the content label and care label are matched with the buyer approved labels. All trims and fasteners are secured and attached right place. Print and embroidery (if applicable) placement are as per the design. No undesired stain, oil mark, chalk mark, pressing mark, and soiling is there on the garments (invisible zones). You may also need to check the quality of the trims. For this follow the fabric and trims test report. Compared trims details against the approved trim card. Check the fabric quality test report (FPT and GPT) for the order you are inspecting – parameters like - fabric GSM, fabric weight, color fastness properties, seam slippage, button pulling strength, dimensional stability, fabric shrinkage user limit (whichever is applicable for the shipment. There should not be an iron mark (shiny mark) and should not be an unwanted crease on the pressed garments. Check garment hand feels and washing quality (if applicable) are as per standards. Follow this checklist for checking garment packing. If available refer to the approved packed garment. Packing list - check the complete packing list and verify whether packing is done as per buyer’s instruction. Garments are packed as per buyer size ratio (if the buyer asked for a ratio packing). correct poly bag size and poly bag material are used. Carton quality – check carton quality for its size and cardboard strength. Carton shape and no space inside the carton. The carton labeling should be checked thoroughly. Check all the required information and carton number is there. The above checklist is a primary guide for quality inspection of the shipment. Follow the detailed inspection instruction from the buyer’s quality manual (if available). The same quality control checklist can be used during internal quality checking and quality inspection. A checklist for quality control saves time and improve productivity in the inspection process. This checklist is a part of the inspection process and but the complete inspection procedure. 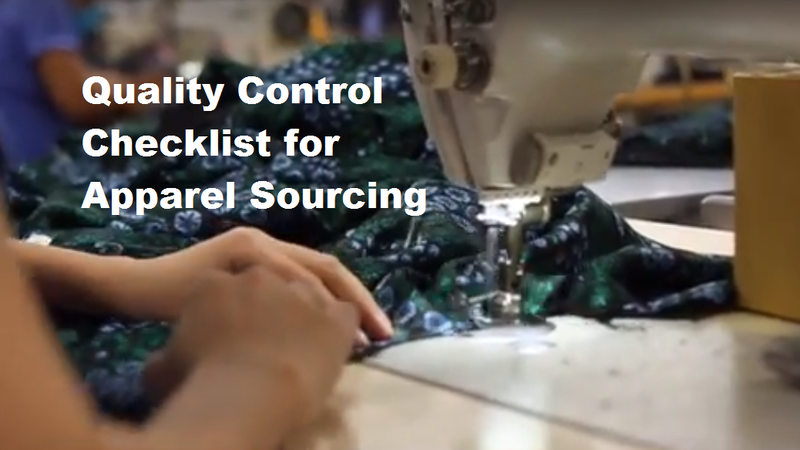 Quality control checklist in garment manufacturing and sourcing. This checklist will help the sourcing agents in shipment inspection.